41. Use it on your air conditioning screen (filter)--your incoming air will smell fresher and the filter is easier to clean. 43. It cleans paint brushes easily and leaves them soft as new. 44. It removes gum from carpets. 45. It removes scuff marks from patent leather shoes. 46. Use it on running rails for sliding glass doors and windows. 47. It removes "ring around the collar". 48. It removes liquid nail (paneling glue). 49. Two glass bowls or glasses stuck together? Drizzle a little S.S.S down the sides and they'll come apart easily. 50. It removes candle wax from furniture, carpets and clothing. 51. Hummingbird Feeders: To deter bees try rubbing SSS on the feeder surface by the feeder ports. 52. Maggots too!! You squirt SSS in can and lid, then later flushed with soapy water, you shouldn't have any bugs in cans rest of summer!!! 53. It is a great furniture polish! 54. Put it in one of those bottles that you attach to your backyard hose and then spray down the back yard! Will cut down on ants, mosquitoes and other creepy crawlies. 55. Spray it on rose bushes to keep the deer from eating them, (used at the cemeteries on the flowers for the same reason). 57. It cuts grease and cleans dirt from range hoods. 58. Add a capful to wash water of clothes...acts as a fabric softener and keeps the bugs off clothes. 59. Spray on orchids and other flowers for moisture and to keep bugs away. 60. Cleans baseball caps. Just spray on and rub with toothbrush. 61. Tomato Plants. Mix one part SSS and 2 parts water and spray on tomato plants to kept tomato worms off. Adding vinegar works fine too. Spray plants about every 2 or 3 days..
62. SSS bath oil also does a great job cleaning cherry wood cabinets. 67. Screens can be lightly sprayed with Avon "Skin-So-Soft" to repel no-see-'ums and tiny gnats that otherwise might slip though the screens. 68. Another use for SSS is it will kill those pesky earwigs. Spray it on & they don't return to life. 69. Also if you ever make candles, use clear wax and melt put skin so soft in it and harden works great for out side in the summer. 70. As a deodorizer, spray into air and let settle, kills those nasty pet orders. 71. Kids rooms if a child wets the bed, spray the bedding and sheets before washing and will give it a fresh clean smell. *Skin-So-Soft bath oil is approved by the FDA/CDA only as a bath oil. This list of uses comes from customers. Avon makes no claims of these uses, nor have they. 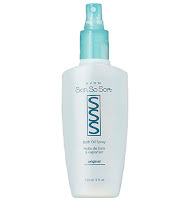 RIGHT NOW YOU CAN PURCHASE A 16.9 OZ BOTTLE OF SKIN-SO-SOFT FOR $6.99 (regularly $13.00). Oooh! I love Avon! Now following you! Who would have known its many uses! Following you from the Blog Hop & Follow Friday at Bloggy Moms! Come visit and follow back! Stopping by from Mailbox Monday! I am an email subscriber. following you from blog hop thursday :) loving your blog already!